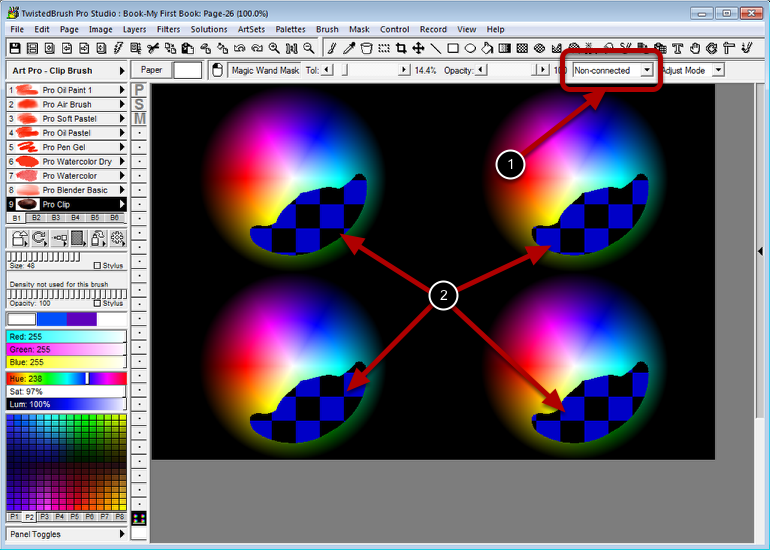 The Magic Wand Mask tool allows you to mask areas based on color, hue, luminance etc from the initial source point (click point). The tolerance slider determines how large of an area will be masked based on similar color or hues. The smaller the tolerance the closer the colors must match for the mask to continue. The tolerance slider is adjusted dynamically (in Adjust Mode) by clicking and dragging on your canvas. As you drag to the right the tolerance value will increase. To fine tune the tolerance press and hold down the Shift key while making adjustments. The Opacity slider (rename to Level in later versions) is the strength of the mask that will be created. 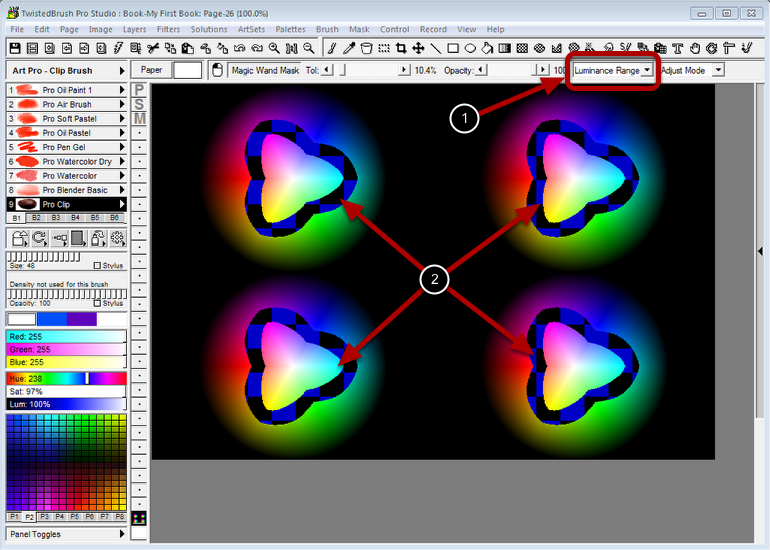 There are a number of different modes for the Magic Wand Mask tool. See below for examples of these. This selection determines if the Magic Wand Mask tool will work in adjustment mode where the tolerance is adjusted as the cursor is moved or if it will work in Repeat mode. In Repeat mode a new fill of the set type and tolerance will occur each time the cursor position is sampled. Here is a basic Magic Wand Mask with the default options of Connected. Notice that all similar colors are masked in your image even if not connected. 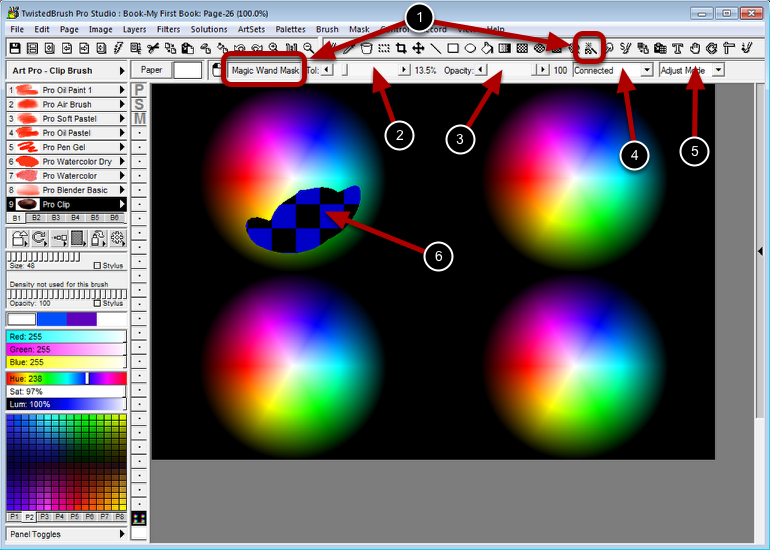 Notice the color ranges that match the initial click point in your image are masked. Luminance Range mode is selected. Notice that matching luminance are masked based in the initial click position. Hue Range mode is selected. Notice that matching hues in the range are masked based on the starting click position. HSL Range mode is selected. Notice that the masked area is based on a HSL combination from the initial click position.